Why is Nordic Walking different to hiking or walking with poles? 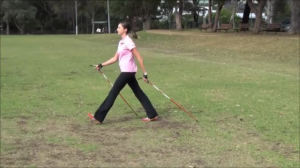 Nordic Walking has a very specific technique and style which is an intensification of normal walking. Whereas just walking with poles can feel clumsy or unsupported, done correctly Nordic Walking can bring about many benefits. What are the benefits of Nordic Walking if I have a neurological condition? How do I learn to Nordic Walk? Due to the specialisation of the technique you are highly recommended to learn in person with a qualified International Nordic Walking Association instructor. Please go through the INWA website to find an instructor near you. If you know of an instructor who is unsure of how to maximize the potential of Nordic Walking for your neurological condition please recommend them to complete the online eLearning Nordic Walking instructor modules for different neurological conditions. Watch this space for some handy tips, tricks and exercises for Nordic Walking.